Error 919 is a problem that tells you don’t have enough spaces in your device now and you will need to fix it. This error also happens because of Play Store application too. 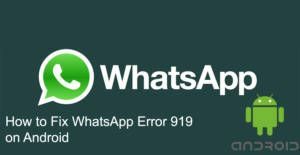 We will tell you how to fix Error 919 on WhatsApp here. You will see this error code while you are also updating, installing or downloading another application. So you can do the similar steps which we will show you below for other applications too. You can comment this page and share your thoughts about solutions. If you cannot fix your problem, you can let us know and we will look alternative ways for you. If you are having another error code in your Android device, you can check our list for installation errors, there is a full list of WhatsApp errors there. You can click on error codes to see solutions for each problems. Let’s tell you how to get rid of this Error 919 on Android. See Also: What will I See on Whatsapp if Someone has Deleted Me? We will give you summarized information for you on here. You can click here to see detailed information and all detailed steps to fix this error. Summary: Firstly clear Play Store application’s cache and data, restart your Android device and try again. Clear cached data of your phone, clear all old applications that you don’t use, clear files that you don’t need at the moment since you need more storage to make new update or installation or download. That’s all you need to do for resolve the problem. Please don’t hesitate to ask questions regarding Error 919 on Android devices. One of our experts will answer your questions as soon as possible. If the steps above, couldn’t resolve your problem, we recommend you to contact support of WhatsApp. This will be the best and the safest option for you. However WhatsApp generally fixing errors or bugs in every updates.